Not only a firm believer but also a sincere practitioner of the challenging and thorny path of simple and ethical living, eminent C.A Dr. Om Prakash Chaplot has really lived it. Born in the small town of Sanwar of Udaipur District, Chaplot settled in Udaipur city and contributed to its social, spiritual and professional life in many ways. He has enthused a large number of students to become C.A who have become highly successful. Truly humble, he is an institution in himself. Realizing the importance of education in life, he inspired his son Mahaveer not only to become a C.A. but also earn his Ph.D. His daughter and daughter-in-law are also C.A and hold high level posts in banks. Chaplot was not been able to see his father’s face, however, his enlightened mother did her best to fulfil her husband’s dream by making her son a C.A. who is a source of inspiration for many. She believes that material things can be taken away but education is an unstealable treasure. At the age of 64 when others think of retirement, Chaplot has secured 75% marks in Information Systems Audit course, really an inspiring example for the youth! He astonished everyone by earning his M.A. degree in Prakrit language from MLSU, Udaipur. His respect for every religion has enabled him to earn his Ph.D. in Sthanak Sutra in Jain Literature. Not stopping here, he passed LLB in first division to serve the society with his knowledge of law. 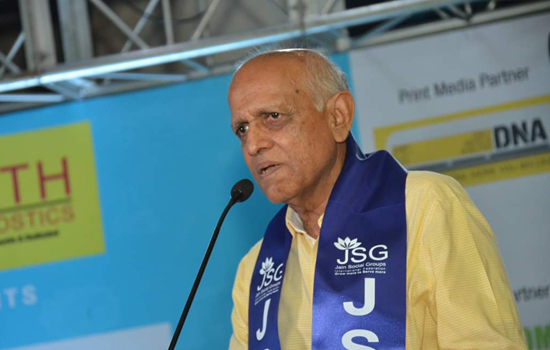 He has helped several communities and reputed institutions by framing their constitutional values and, thus, in finding a high place in the society. He has held important posts in several social organizations like Lions Club, Jain Social Group to cite a few. He has provided support and guidance to several religious and social organizations to create awareness about health. He is an eminent practitioner and trainer of Yoga. Chaplot believes in keeping the nation supreme and if it calls for any sacrifice, he is prepared to go to any lengths. He believes in charity but prefers not to publicise his noble deeds. He is a living example of the Jain principles of Satya, Ahimsa and Aparigrih. In recognition of his services, he has recently been nominated as First Regional Chairman of Mewar Region of Jain Social Group International Federation. Chaplot gives full credit for all his achievements to his wife Smt. Shambhu Devi. She stood rock strong and walked hand in hand with Chaplot during all his struggles and hard times. Following in the footsteps of his father C.A. Dr. Mahaveer Chaplot, Chief General Secretary, JITO Udaipur; he secured AIR 49 in CA Foundation; he became one of the youngest President of C.A. Association, Udaipur and has done a lot of commendable jobs. His highly successful Vandemataram programmes in Udaipur, Rajsamand and Chittorgarh have inspired everyone in taking up social service for instilling patriotism. He stands honoured on Republic Day in the year 2009 by District Collector. He has won the National Bar Award from All India Bar Association and many more prestigious awards. CA Meenu Chaplot, wife of Dr. CA Mahaveer Chaplot, is an office bearer of JITO Queens Chapter, Udaipur. Earlier she was a member of Executive Committee of Udaipur Chapter, I.C.A.I. The Lake City feels proud of its versatile, dedicated, and humble son of soil, Dr. C.A. Om Prakash Chaplot.